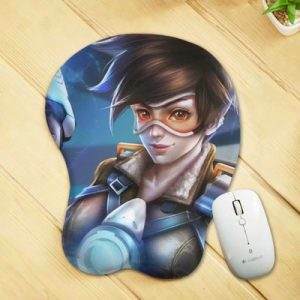 Tracer, real name Lena Oxton, is a British pilot and adventurer. She wields dual rapid-fire Pulse Pistols, and is equipped with a “chronal accelerator” which grants her the ability to either jump forward in time, crossing many meters in a split second (Blink) or rewind three seconds into the past to heal and restore ammunition (Recall). Her ultimate ability is Pulse Bomb, an explosive charge that sticks to enemies, exploding after a brief delay for massive damage. Born in London following the events of the Omnic Crisis, Lena Oxton became the youngest test pilot in Overwatch’s experimental flight program, and was tapped to test the “Slipstream”, a fighter jet that used teleportation technology. During the test flight, a malfunction caused the craft to vanish and Tracer along with it. She was presumed dead. However, she reappeared months later, though suffering from a condition preventing her from maintaining a physical form and which caused her to vanish for hours or even days at a time. It was discovered that the accident desynchronized her molecules from time itself, a condition eventually called “chronal disassociation.” The enhanced gorilla scientist Winston invented the chronal accelerator to re-synchronize her with the normal flow of time. Tracer was the first Hero developed for the game and used to test the gameplay mechanics. Tracer features in the cinematic trailer, teamed with Winston as she tries to stop Widowmaker and Reaper from taking Doomfist’s gauntlet. She also appears in the cinematic short “Alive”, as she unsuccessfully tries to stop Widowmaker from assassinating the omnic monk Tekhartha Mondatta in London. Tracer is featured on the game’s cover art, and is a playable hero in Heroes of the Storm. It was revealed in an Overwatch comic that she is a lesbian. Tracer is voiced by Cara Theobold.